Sir Christopher Wren's design for the Royal Hospital is based on the Hôtel des Invalides in Paris. The original building was intended to house 412 veteran soldiers and their officers and comprised a single quadrangle, known as Figure Court. However, before work had begun it was realised that the buildings would be insufficient and Wren added two further quadrangles to his design. In 1686, construction was approved and building commenced. 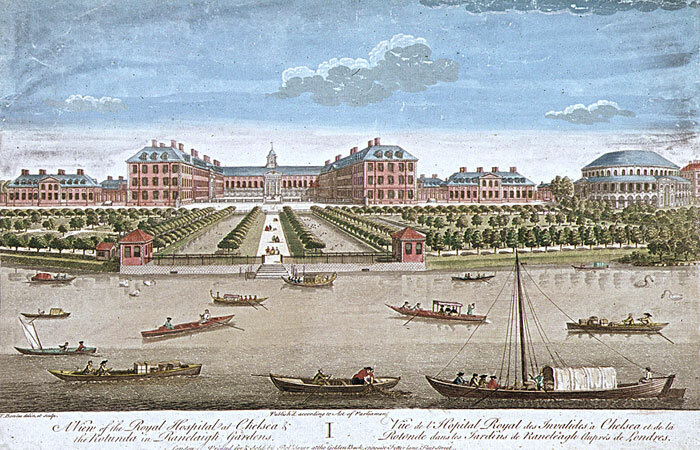 In 1692, the Royal Hospital was able to open its doors for the first time. On February 4th, the first group of 99 Chelsea Pensioners were installed and on March 28th the full complement of 476 was made up when they were joined by a further 377 residents. The early funding of the Royal Hospital was made from deductions from army pay, with occasional funding from other sources. This continued to be the Royal Hospital's main source of revenue until 1847. Since then the Royal Hospital has been supported by 'Grant-in-Aid' from the Ministry of Defence and a small income from the Army Prize Money and Legacy Fund.